Me Again was a quick heartwarming read. It reminded me of the Harrison Ford movie Regarding Henry. 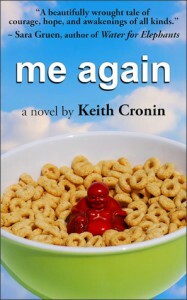 A man, Jonathan, wakes up from a 6 year coma with his memory gone. As we get to know the man who woke up, we see him try to piece together the man he used to be, and he begins to realize that he probably wasn't a very nice, or good person. He learns of certain things he did, and while he is unable to recall doing them, he still has to come to terms with the shame he feels at having been that sort of person. Mr. Cronin obviously did his research with regard to traumatic brain injuries and the various changes that can manifest as its subjects try to recover. It was completely believable how Jonathan and his friend Rebecca, who he meets in the hospital as she also tries to recover from a stroke, underwent drastic changes in their personalities.